Na wczorajszym Directcie zaprezentowano aktualizację do Slatoona 2 oznaczoną numerem 4.0.0, która stała się dostępna do pobrania zaraz po prezentacji. Na szczególną uwagę zasługuje nowa kolekcja broni marki Kensa, składa się ona głównie ze znanych nam wcześniej narzędzi zagłady. Element wyróżniający stanowi stylowa czarno-biała kolorystyka zestawu. Kolejną dużą zmianą jest podzielenie Splatfestów na dwie kategorie Normal i Pro. Tryb Pro jest zbliżony do tego co znaliśmy do tej pory. Normal umożliwi granie z mniejszą niż 4 liczbą znajomych, w prowadzi również bonus za wybieranie bardziej zbilansowanego ekwipunku. This category can be played solo or as a team of up to 4 friends. Playing with fewer than four friends will add the appropriate number of other players to your team. When you select „Continue” or „Change gear and continue!”, you can continue onto the next battle with the same team. Points for turf inked by individual players are added to the points earned by the team for winning a battle, resulting in a value known as „Clout,” and the side with the most Clout at the end of a Splatfest is the winner. Clout is not added for battles between the same side. If the combination of visual look and type of all 4 teammates’ gear/weapons meets certain conditions, a Synergy Bonus is triggered, and you can receive more Splatfest Points or Clout Points when you win. Teams that meet these conditions are awarded a special team name, which is displayed at the start of a battle. When you’re on a winning streak, you’re more likely to match with other teams on a winning streak. When there are multiple teams with the same number of consecutive wins, you’ll be matched with a team as close to your skill level as possible. This category is closer to what you’ve experienced when battling solo in previous Splatfests. Players join battles on their own, and seek to increase their Splatfest Power while putting their turf war skills to the test. When you win a battle, you increase your own Splatfest Power and receive Clout equal to the opposing team’s approximate Splatfest Power. The side with the most Clout when the Splatfest concludes wins. Battle participants are chosen from players that are as close in Splatfest Power as possible. The top 100 players in the Splatfest Power rankings on each side will be displayed on SplatNet 2 in the Splatfest Top 100 list. Continuing to earn experience even after a Splatfest Tee is at max level will earn players a random ability chunk each time they pass a certain point threshold. ’10x Battles’ and ‚100x Battles’ will now occur randomly, earning players on the winning team a huge boost of Clout for their side. When a friend wins a 10x Battle, or someone somewhere wins a 100x Battle, that information will be displayed on the Lobby screen or the signboard in Inkopolis Square. The amount of Splatfest Power does not increase in these battles. Layout and terrain of certain stages has been modified. Changed terrain in all modes. Made major changes to the terrain from the spawn points to the center of the stage. Changed terrain placement in Rainmaker. Added a slope near the center. Adjusted placement near the spawn point. Changed terrain placement in Clam Blitz. Added obstacles and changed placement of terrain throughout the stage. 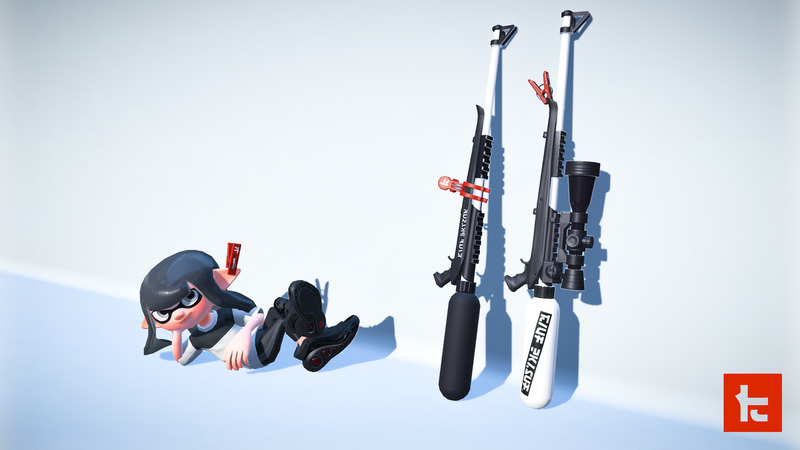 Specifications for some of the main weapons have been changed. Extended distance at which max damage can be dealt by roughly 14%, without changing firing distance. Increased the radius of area inked where a shot lands by roughly 20%. 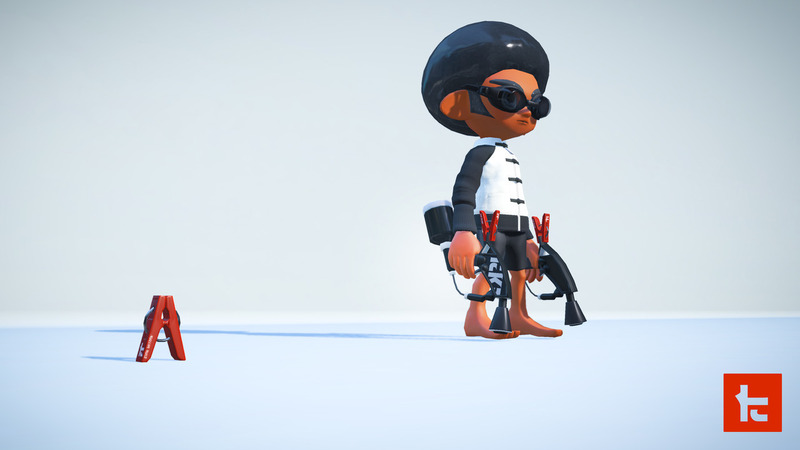 Increased the walking speed when not shooting, and the speed of movement in squid form, to be like that of the Sploosh-o-matic or the Splattershot Jr. Reduced maximum damage when hitting a target with the base of the ink from 70.0 to 50.0. Increased ink consumption by roughly 14%. Reduced damage dealt to the Rainmaker barrier by roughly 17%. Reduced damage dealt to an opponent’s umbrella by roughly 20%. Reduced damage dealt to an opponent’s Splash Wall by roughly 20%. Increased ink consumption for a dodge roll from 6% of the player’s Ink Tank to 9%. Specifications for some sub weapons have been changed. When two Ink Mines are placed in a stage and then a third is placed, the first Ink Mine explodes rather than simply disappearing. Ink Mine explosions now deal 45.0 damage to a player at extremely close range, and deal 35.0 damage in all other instances. Specifications for some special weapons have been changed. Reduced active time by roughly 0.5 seconds. Now blocked not only by the opponent’s spawn point barrier, but also by the barrier of user’s spawn point as well. Specifications for points required for some specials have been changed. Adjusted the coloring of display elements in certain Ranked Battle modes, which previously obscured on-screen numbers, depending on the ink color. Adjusted character posture so that the direction ink shoots matches the direction that the weapon is pointed when firing in midair with shooters and dualies. This is a visual change only; there is no change to the direction the ink shoots. Fixed an issue in which the player would stay airborne longer than intended if they fired while jumping near a wall and hit their head on a metal grating. Fixed an issue in causing the sound effect for destroying an opponent’s umbrella to play multiple times due to poor connection quality. Fixed an issue in which the surface around a spawn point would not be inked when a bomb or other object was exploded within the spawn point barrier. Fixed an issue causing the landing marker for a super jumping player that fell off the stage or landed in water to stay visible for a brief time on the screens of other players. Fixed an issue with certain chargers causing slightly more ink than intended to be consumed when firing a fully-charged shot after charging while in midair. Fixed an issue causing shots from the Bloblobber fired while up against a corner stage terrain not to bounce away, but to disappear inside the stage terrain instead. Fixed an issue causing Curling Bombs not to damage Splash Walls if the bomb was moving slow enough at the point of impact. Fixed an issue preventing character animations from occurring when using a special weapon while falling. Fixed an issue causing shots fired by the Inkjet not to explode when striking corners of the stage terrain at specific angles and in specific locations. Fixed an issue causing players using an Inkjet to be splatted after being returned to the spot they activated the special if they touched water just as the Inkjet’s duration ran out. 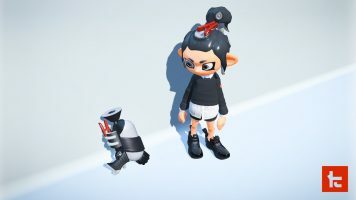 Fixed a rare issue that caused damage to be dealt to the player and not the armor if the player received damage just as they activated Ink Armor. Fixed an issue when aiming Tenta Missles at midair targets or targets near a drop off that caused the hit markers to display mistakenly in the middle of the stage. Fixed an issue when flinging ink with a roller or firing a charger in a way that would overlap with an Ink Storm’s cloud that caused shots from the weapon not to appear correctly. Fixed an issue causing the explosion sound for a Curling Bomb not to occur if the bomb exploded inside a bubble when two bubbles were stacked on one another. Fixed a rare issue in Clam Blitz that caused a power clam tossed at the goal to be unable to be picked up after dropping to the ground. Fixed an issue in Clam Blitz occurring after the barrier had been removed, making the power clam unable to be picked up if it had been thrown repeatedly. Fixed an issue in Clam Blitz causing a match that had previously gone into overtime and should have ended as soon as one team’s counter takes a single point lead, to mistakenly end after that scoring chance ended, or until another clam entered the goal. Fixed an issue in Clam Blitz causing the power clam indicator to point in the wrong direction when a power clam is off-screen. Fixed an issue on the stage Inkblot Art Academy allowing players super jumping from a certain location to reach an elevated position that should be inaccessible. Fixed an issue on the stage Moray Towers causing turf inked not to appear as inked on the turf map. Fixed an issue on the stage Snapper Canal causing bombs tossed onto the grating near the middle of the stage to bounce in an unnatural way. Fixed an issue on the stage Snapper Canal allowing players to enter inside a particular feature of stage terrain. Fixed an issue on the stage Snapper Canal allowing players to get over the barrier surrounding a team’s spawn point. Fixed an issue on the stage Walleye Warehouse allowing players super jumping from a certain location to reach an elevated position that should be inaccessible. Fixed an issue on the stage Piranha Pit allowing players to enter inside a particular feature of stage terrain. Fixed an issue on the stage Camp Triggerfish causing players to fall off the stage when moving toward one of the pillars on the floodgates. Fixed an issue on the stage Camp Triggerfish causing players who super jumped to a Squid Beakon in a certain location to enter inside the stage terrain. Fixed an issue on the stage Wahoo World allowing players to enter inside a particular feature of stage terrain. Fixed an issue in Ancho-V Games causing players who returned to the area around the lifts after using an Inkjet, or super jumped to that location to enter inside the stage terrain. Increased the number of Golden Eggs that appear after defeating a Griller from three to five. Rank can now be reset to Profreshional 40 when visiting Grizzco Industries once title and rank have reached Profreshional 100 or higher. A teammate other than you contributed an insignificant number of Golden Eggs in relation to the total collected by the team. The background music playing during a regular enemy wave will now change when players use a certain combination of supplied weapons. Players can now earn more than 99,999 Grizzco points during a single session of Salmon Run. It is now possible to set the Hazard Level to 200% right from the start when playing at The Shoal. Added two new weapons to choose from when playing at The Shoal. Fixed an issue causing a Maws not to attack even while directly below a player’s feet. Made an issue causing a Maws to attack in midair when targeting a player that has just jumped off of a drop off less likely to occur. Fixed an issue causing shots fired at the indestructible portions of a Steel Eel to continue to be blocked after it had been defeated but before it had completely disappeared. Fixed an issue causing a Golden Egg that a Snatcher had picked up not to drop when the Snatcher was defeated. Fixed an issue preventing damage to a Steelhead’s weak point if stage terrain of a particular height was above the Steelhead. Fixed an issue causing the duration gauge for the Inkjet not to display properly if the Inkjet was used repeatedly in short bursts. 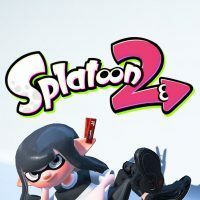 Fixed an issue causing the player to enter into stage terrain if a Steel Eel or Scrapper was present when returning to the spot an Inkjet was activated. Fixed an issue in which disconnections were caused during fog events when multiple Goldies were defeated simultaneously, creating a large number of Golden Eggs all at once. Fixed an issue on the Lost Outpost stage in which a Griller targeting a player standing near the egg basket would switch to target another player instead. Fixed an issue on the Salmonid Smokeyard stage in which players who jumped repeatedly in a location where the egg basket appears during low tide wouldn’t drown when the water level went up. Player icons in the upper portion of the screen will now display the following information: combined total of splats and assists, number of specials used, and current special gauge amount. Pressing the “-“ button while spectating will toggle this display on and off. It is now possible to zoom further out on certain stages when using the top-down camera view than it was previously. Added an automatic spectator camera that will switch between the players it focuses on automatically. 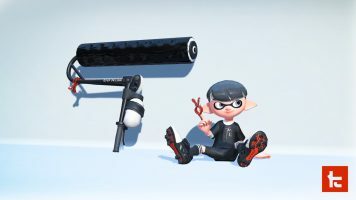 Fixed an issue causing the animation shown in spectator mode to appear differently than on the player’s screen when damaging the Rainmaker barrier with a Bubble Blower bubble or Ink Storm. Fixed an issue when spectating Clam Blitz causing the goal to disappear from the display depending on how the camera view was switched. Slightly extended the range of camera movement when spectating Blackbelly Skatepark making the goals in Clam Blitz matches easier to see. Fixed an issue occurring when jumping on a ride rail after charging a shot with a Splatling or Charger causing the player to keep the charge but not removing the appropriate amount of ink from their ink tank. Fixed an issue occurring when jumping onto a ride rail with a charged charger shot and releasing ZR at the same time, causing the shot not to fire. Fixed issues with the pose of the player character when preparing to use sub weapons and certain special weapons while riding a ride rail. Fixed an issue in stages with restrictions on player ink in which pressing ZR in midair while using a charger failed to charge the weapon. When players choose to “Change gear and continue!” and are selecting gear in between Regular and Splatfest battles, a sound effect will now play notifying them when time is running out. When viewing the friend list, a sound effect will now play notifying you when a friend becomes available to play with. Fixed an issue occurring on the X Rank results screen while calculating X Power in which the highest X Power would temporarily be displayed incorrectly, preventing the actual number from being displayed. Fixed an issue causing the current page number not to display correctly if you have too many clothing items. Fixed an issue that caused the game to crash when tapping an amiibo on the Equip screen after choosing “Change gear and continue!” after a match. Fixed an issue occurring while taking pictures with an amiibo character during a Splatfest in a specific location that caused other players to appear between the camera and subject.